244 pages | 102 B/W Illus. Environmental Transport Phenomena offers a detailed yet accessible introduction to transport phenomena. It begins by explaining the underlying principles and mechanisms that govern mass transport and continues by tackling practical problems spanning all subdisciplines of environmental science and chemical engineering. Environmental Transport Phenomena makes an ideal textbook for a one-semester advanced undergraduate or graduate introductory course in transport phenomena. It provides a fundamental understanding of how to quantify the spread and distribution of contaminants in the environment as well as the basis for designing processes related to water purification, wastewater treatment, and solid waste disposal, among others. "This textbook, authored by accomplished professors, is a very comprehensive resource for modeling and analyzing the environmental fate of chemicals and contaminants in the ecosystem using fundamental principles of transport phenomena." "The approach and selected topics are excellent. … I believe the book Environmental Transport Phenomena will give an in-depth understanding of transport phenomena and how it is applied." 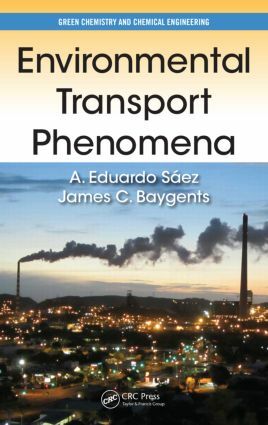 "…the authors of Environmental Transport Phenomenahave done great work by including several illustrations and examples to explain the fundamental concepts in each chapter. Overall, the book is well organized. I strongly recommend it for senior chemical and environmental engineering undergraduate students, for courses on process modeling and simulation, and for graduate students taking courses in transport phenomena." A. Eduardo Sáez is a distinguished professor in the Department of Chemical and Environmental Engineering and an adjunct professor in the Mel and Enid Zuckerman College of Public Health at the University of Arizona, Tucson, USA. He holds a B.Sc from Simón Bolívar University, Caracas, Venezuela, and an MS and Ph.D from the University of California at Davis, USA. Dr. Sáez has been a faculty member at Simón Bolívar University and North Carolina State University, Raleigh, USA, and a visiting scholar at Bristol University, UK, and Pacific Northwest National Laboratory, Richland, Washington. He has earned numerous awards for his research and teaching. James C. Baygents is the associate dean for academic affairs in the College of Engineering at the University of Arizona (UA), Tucson, USA. He is also a member of the Department of Chemical and Environmental Engineering and the Program in Applied Mathematics at UA. He holds a BS from Rice University, Houston, Texas, USA, and an MA and Ph.D from Princeton University, New Jersey, USA. Dr. Baygents has been a visiting scientist and research fellow at the Space Science Laboratory at the NASA Marshall Space Flight Center, Huntsville, Alabama. He has earned numerous awards and received recognition for his research and teaching.